I am pleased to announce Queer Eye’s Karamo Brown will be giving the Keynote Address at OutRight's 4th annual OutSummit! Plus, the lawyers who helped to decriminalize homosexuality in India will also brief participants. OutSummit is a one-day conference on LGBTIQ issues, full of speakers and workshops addressing challenges and opportunities to advance human rights for lesbian, gay, bisexual, transgender, intersex and queer (LGBTIQ) people all over the world. Also remember that LGBTIQ activists from every region will be there! This year’s conference will again be co-hosted by our generous partners, the Sorensen Center for International Peace and Justice at CUNY School of Law as well as the CUNY Law Review. Also, due to this exciting announcement, we have extended early bird ticket sales until Monday, November 5th. Click here to register early! Please read on below for more information about our featured speakers. Register for Early Bird Tickets until Monday November 5! 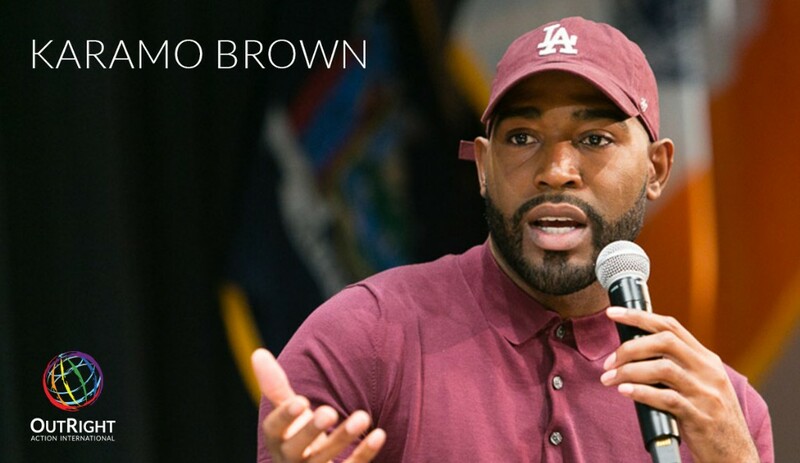 Karamo Brown is a TV personality best known for being the ’culture expert’ on Netflix’s reboot of Queer Eye, where his job is to makeover the mind and hearts of the people he is helping, by guiding them to figuring out the root of their issues. Karamo worked as a licensed social worker and psychotherapist for nearly a decade. The father of two began his television career in 2004 on MTV’s reality show The Real World: Philadelphia - where he became the first openly gay black man to be cast on reality TV. A plenary session will feature Menaka Guruswamy and Arundhati Katju, the lawyers who petitioned the Indian Supreme Court to strike down Article 377 of the Penal Code, which criminalized homosexuality. The decision to overturn Article 377 was finalized September 6, 2018 and decriminalized homosexuality for 1.3 billion people in India. Guruswamy and Katju will be joined by fellow lawyers and activists for a discussion about the global repercussions of this historic ruling. Read more about the decision here. 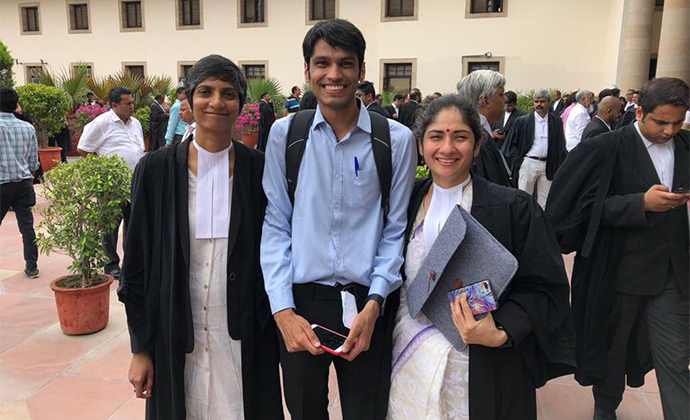 Pictured: Menaka Guruswamy, Kumar Vardhman (petitioner), and Arundhati Katju before oral arguments in July. Photo courtesy of Columbia Law. 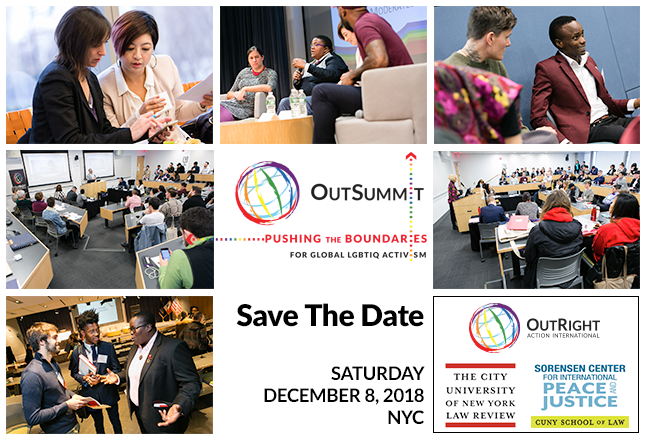 OutSummit is a one-day conference, hosted by OutRight Action International, a global LGBTIQ Human Rights organization, and co-hosted by CUNY School of Law and the Sorensen Center for International Peace and Justice. OutSummit brings together international and US-based LGBTIQ activists for a day of speakers and workshops to address the challenges and opportunities to advance rights for lesbian, gay, bisexual, sexual orientation, gender identity, and intersex issues globally. OutSummit wraps up OutRight Advocacy Week at the United Nations, where LGBTIQ activists sit across the table from the world’s most pivotal governments and UN officials to name their priorities and demand accountability. Over 40 activists will be arriving in New York City to share their experiences advocating for LGBTIQ people around the world and learn together in a collaborative environment. During OutSummit, you will hear from these activists through panels, workshops, and presentations. Participation in OutSummit entitles experienced and newly admitted attorneys to continuing legal education (CLE) credits. The full list of CLE-accredited panels and workshops and their CLE credit value will be made available shortly. Attorneys attending only part of a session are not eligible for partial credit. Attorneys arriving late are welcome to attend the program but will not be eligible for credit. If you are interested, choosing "CLE & OutSummit Registration" will register you for the entire conference and the CLE workshop, whereas the "CLE Workshop Only" ticket will limit your access to the conference to the one litigation workshop. Please contact Em Rubey, OutSummit Coordinator, at erubey@OutRightInternational.org for more information. CLE Credits provided by Community Legal Resource Network at CUNY School of Law— CLE programs are approved for both experienced and newly admitted attorneys. Under Continuing Legal Education regulations, CLE credit will be offered only to those attorneys completing entire sessions; attorneys attending only part of a session are not eligible for partial credit. Attorneys arriving late are welcome to attend the program but will not be eligible for credit. Financial assistance is available for CLE credits. Please email erubey@outrightinternational.org for information about the sliding scale and how you can access a discounted rate. Contact development@OutRightInternational.org for information about getting involved to assist OutRight staff at the event.